The Way of St James, or Camino de Santiago is a network of trails across Europe. They all lead to Santiago de Compostela in Galicia, North West of Spain. Pilgrims have been walking these trails since the Middle Ages, on their way to Santiago Cathedral, where the remains of St James are reputedly buried. While most people refer to ‘The Camino’ there are, in fact, many Caminos. The Camino Frances, however, attracts the majority of pilgrims. Approximately 65% of all Compostela certificates issued by the Pilgrim Office in Santiago are awarded to pilgrims taking the Camino Frances. Read more about the history of the trail: History of the Camino de Santiago. Not really, people from over 150 nationalities walk the Camino each year. Many do so for religious or spiritual reasons but many others as a unique experience, as a personal challenge or simply to take a break from everyday life. 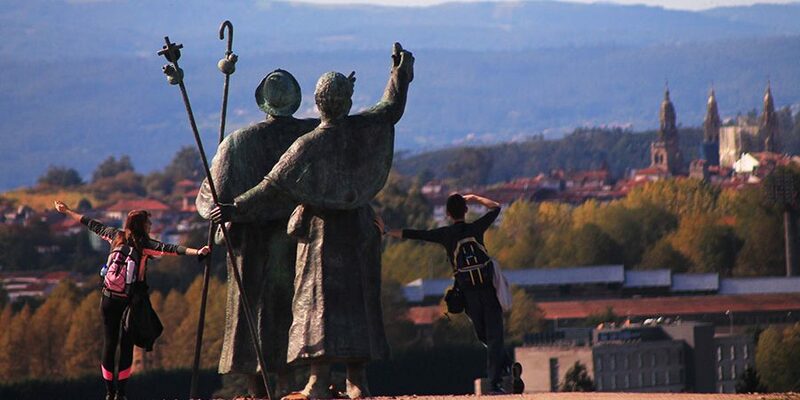 Every one has their own ‘Camino’ and each pilgrim their own reason to walk to Santiago. All of them as important as each other. Where is the start of the Camino de Santiago? That will depend on how long you’d like to walk and which Camino route you’ll take. The beauty of the Camino is that you can walk as much or as little as you wish or can. The starting point of the Camino Frances is the French town of St Jean Pied de Port at the foot of the Pyrenees for instance, 800kms away from Santiago. However you can start your Camino at any point along the route. 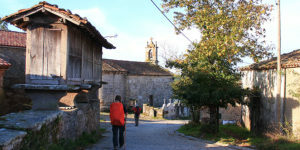 In fact, a big number of pilgrims start in Sarria (100kms away from Santiago). Lisbon is the starting point of the Camino Portugues, the second most popular route. How long does it take to do the Camino? It takes approximately 5 weeks to walk the Camino Frances from St Jean Pied de Port; 5 weeks to walk the Camino del Norte from San Sebastian; 4 weeks to walk the Camino Portugues from Lisbon and 2 weeks to walk the Camino from Porto for instance. The Camino Ingles from Ferrol takes only one week to complete. Many French Camino routes converge at St Jean Pied de Port such as Le Puy route so you could actually be walking all the way from central France or even Paris. It is worth mentioning, however, that many pilgrims start closer to Santiago and adapt the length of the journey to their ability and time they have available. 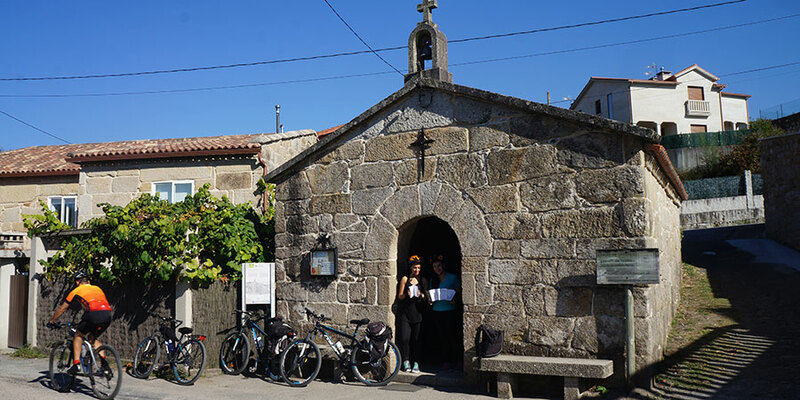 It is also possible to cycle most of the Camino routes which will allow you to cover more ground but we only recommend this if you are experienced. Which of the Camino de Santiago routes should I take? It is up to you but if this is the first time you experience the Camino, you’d probably like to meet fellow pilgrims and enjoy the unique atmosphere of the Camino Frances or Camino Portugues for instance. 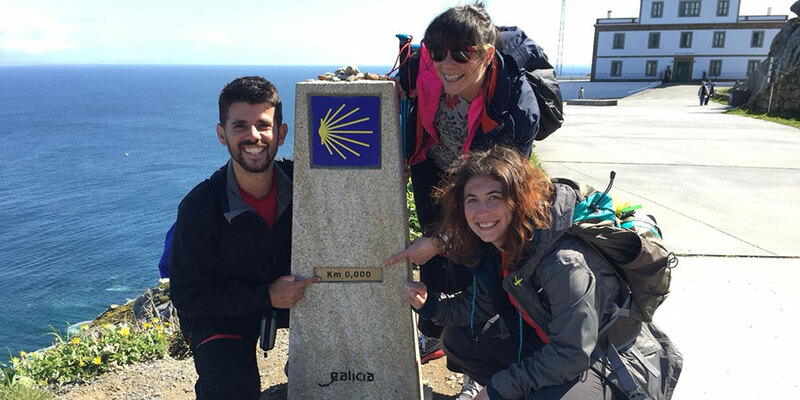 If you are looking for a coastal route the Portuguese Coastal Camino is a superb option, as well as some of the sections of the Camino del Norte and the Camino to Finisterre and Muxia. If you are looking for an off the beaten track Camino trip, there are many other routes you can explore such as the Camino de Invierno. How fit do I need to be for the Camino? 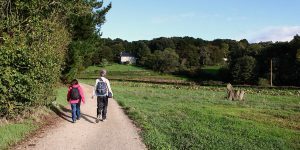 Everyone can experience the Camino but if you are looking to walk a long stretch of the Camino (longer than a week), you will need to be in reasonable form, so we recommend you get walking and building up the miles before your trip. To help you get ready, you can download our Camino fitness guide. What are the accommodation options on the Camino? You can find all kind of kind of accommodation options along the Camino Frances, ranging from public hostels to private hostels, guesthouses and hotels. Accommodation on the least known Camino routes can be limited however. At CaminoWays.com we work with hotels and guest houses along the routes to include private en suite rooms to our clients. In certain routes, ‘superior’ options will also be available, such as paradores, 4 and 5-star hotels and boutique ‘casas rurales’. Read our blog post about accommodation here for more details: Camino de Santiago accommodation options. What is the ‘pilgrim passport’? The ‘crecendial’ or pilgrim passport is a document issued by the Cathedral or your local St James Association that you can stamp along the way. You will need to show it at the Pilgrims Office in Santiago in order to receive your Compostela certificate. Read more about the Camino passport and certificates here: Camino Culture. 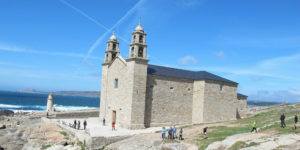 The spiritual end of the Camino is the Cathedral in Santiago de Compostela, however many pilgrims continue on to Cape Fisterra. At CaminoWays.com we look after the logistics of organising a Camino trip. Most of our clients opt for self-guided tours which include a day by day itinerary, pre-booked accommodation and luggage transfers, as well as a holiday pack with practical information and the official pilgrim passport. We also organise a number of guided tours departing on specific days. Other services such as airport pick up and other requirements for groups for instance can also be organised. Many pilgrims organise their Camino trip themselves, of course; we just make it easier so you only have to pack your walking shoes and enjoy this memorable journey.